Description - Typical coloration of Black Bears in the west is black to cinnamon with a white blaze on the chest and in the east, black. On Gribble Island and the neighbouring mainland of British Columbia individuals are nearly white. The snout is tan or grizzled with a straight or slightly convex profile. Average weight is 200-600 pounds. Distribution - Black Bears inhabit heavily forested areas, dense bush and wooded mountains throughout most of British Columbia. They tend to wander a great distance, some male adults having lifetime ranges of 500 to 620 square miles. Biology - 1-5 cubs are born in January to early February generally every second year. The Black Bear young weigh only one-half a pound at birth. This uniquely North American bear is generally nocturnal and solitary. It is classed as a carnivore although most of its diet consists of vegetation such as twigs, buds, leaves, nuts, roots, various fruits, corn and berries. They are also good fisherman and feed on spawning salmon. Before winter it puts on a great supply of fat, then holes up for the winter in a sheltered place. 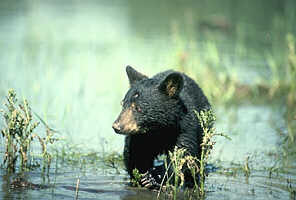 Hunting Black Bears is a popular sport, the meat is eaten and often the hides are made into rugs. The tracks of this slightly pigeon-toed creature are characterized by the overlapping of the hind prints onto those of the front. The heel pad of the rear foot is long and vaguely resembles that of a human. Five toes with equally long claws are evenly spaced along the top of this pad.